Simultala Answer key 2018: Bihar Simultala Awasiya Vidyalaya has organized the admission test for a massive number of students seeking admission into class 6th, class 7th, class 8th, and class 9th. This year a large number of competitors have appeared for the Bihar SAV admission entrance test. The SAV Bihar has conducted the preliminary examination on 20th May in many examination centers across the state. This was the Pen-paper based examination attempted by all the hopefuls applied for the admission in Bihar Simultava Awasiya Vidyalaya. Candidates attempted this examination can get the Bihar SAV Answer Key PDF from the official website, savbihar.ac.in. Students competed for the Bihar SAV preliminary examination can download Bihar SAV answer sheet PDF for all sets and compare with the relevant set to estimate the probable score. Students can check their chances to get admission in Bihar SAV by comparing with the answer key. Go through the following article for more information regarding Bihar Simultala Awasiya Vidyalaya Answer Key for 6th/7th/8th/9th Classes. Simultala Awasiya Vidyalaya, Bihar offers the state level Gurukul residential education for the students. It has introduced the Guru and Gurumata ashram system in the state of Bihar. The Bihar SAV will give admissions for the students in 6th, 7th, 8th, and 9th classes. In order to get admission, students have to qualify the entrance examination with good merit. The entrance test will be conducted in 2 different phases, preliminary and mains examination. This year the Bihar SAV admission test application process was started on 10th April and continued till 4th May. The organization has accepted applications from eligible and interested aspirants during the application period. As per the statistics, this year the competition is severed to get admission in Bihar SAV. Almost all the students applied for the admission test have appeared for the examination (preliminary) on 20th May. The PPB has conducted in many examination centers across the Bihar state. Students competed for the preliminary examination can download Bihar SAV Answer Key PDF 2018 [prelims] from today. The answer key was released by the organization and it is accessible to download on savbihar.ac.in. 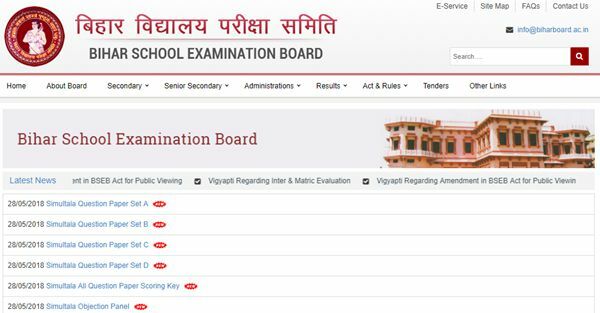 Students can download Bihar Board SAV 2018 for 6th Class, 7th Class, 8th Class, 9th Class. The Bihar SAV Class-wise answer key is accessible to download on Bihar SAV official website, savbihar.ac.in. Students competed for the test can download answer key for the corresponding class and corresponding set to estimate the probable score in the examination. Candidates clearing the preliminary examination will get the chance to appear for mains examination, which is going to be conducted on 17th June. Enter the necessary details like roll number, password etc to download the answer key. Go to the answer key of corresponding class and corresponding set. Estimate the score and take a printout if needed for further verification. I think something is inside on the part of JNV management on making delay in declaration of result. They are just making stupid aspirants & parents by extending the date of results. Authority concern must to active on the issue. Sir pt ka result kab tak ayega? Kam se kam result k bad 15 days dijiye beo se admit card banwane k liye warna PT ke admit card par hi exam dene diya jaay. comment kyo Mangte h .comment ka answer kyo nhi dete h .humlog apke ans, integar krte h.ple.answer digiye. why any information not shows website and anywhere? Kisi k pas answer key cl 6 ka ho to share kare. Sirji,good evening.SAV enttrance PTexam .which was held (20/05/18) me maine 122 score kiya h.kya mera sele,mains me ho payega.mai general catagory se hu.Plese sirji,jarur aur jald bataye. What will be the cut off marks of simultala entrance PT exam2018.I got 122/147 marks in PT entrance Can I select for mains? Abhigyan ji answer key ho to hame bhi share kare . When will the result of preliminary exam published?